I could not let another New Year go by without writing heads of government to ensure that the sordid history of the PENTA vaccine is recorded in your correspondence archives. According to the SickKids Foundation, anaphylaxis to foods is affecting approximately 300,000 children and their families in Canada. It is unsure whether this estimate includes the first wave of the epidemic that included my son, who is now an adult at 23. 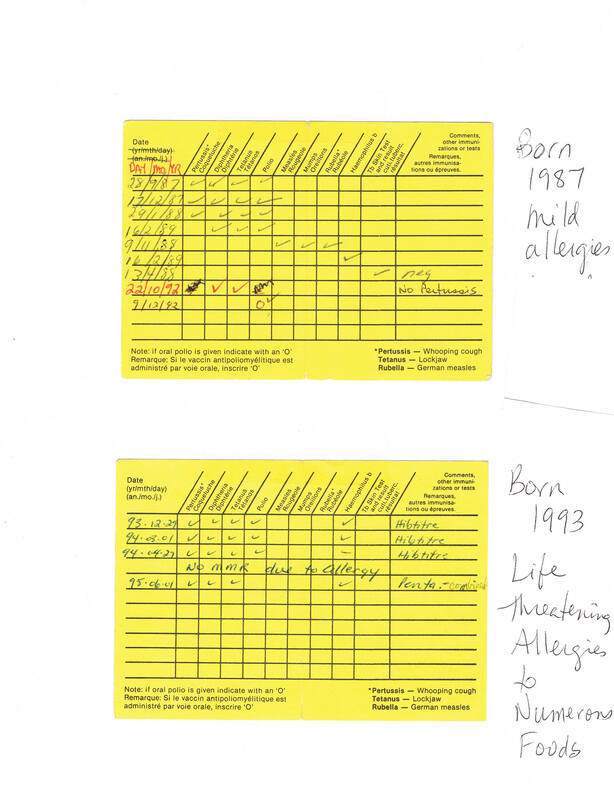 What was the difference between his vaccination schedule and his mildly allergic sister 6 years older? While our daughter received the polysaccharide Hib – on its own – at the age of 18 months, our son was in the first wave of children to receive various conjugate Hib vaccines (adjuvanted) concurrent or combined (PENTA 5 in 1) with the DPT-IPV in infancy. The scientific literature is clear …. Vaccines can cause anaphylaxis. That was in 2008. I would hope that you and every other doctor, government and public health official in this country would find it unacceptable that 1 in 10 children in Canada live with life threatening conditions, and would leave no stone unturned to find out WHY. While a single measles case can cause pandemonium, the numbers of these affected children continue to rise without any alarm bells. What is being done by government and health officials, other than throwing money at MedicAlert bracelets, to address the epidemic of life threatening conditions in children? Parents of children affected by food anaphylaxis and/or autism have spent numerous years and countless hours investigating why our children are affected with such severe immune system and brain malfunctions. The PENTA Project investigations have revealed that the PENTA 5 in 1 combination (1994 – 1997) did not have a DIN # or a Notice of Compliance rendering it illegal according to Health Canada. 11,000+ adverse events, including deaths, were reported to PHAC for the PENTA combination over the three years that PENTA was in use. You may request PHAC ATIP reports A-2013-00096 and A-2013-00097 to view all of this data, which is too large to upload to a website. All subsequent 5 in 1 vaccines including Pentacel and Pediacel are based on this illegal combination, putting into question all vaccine schedules since 1994. 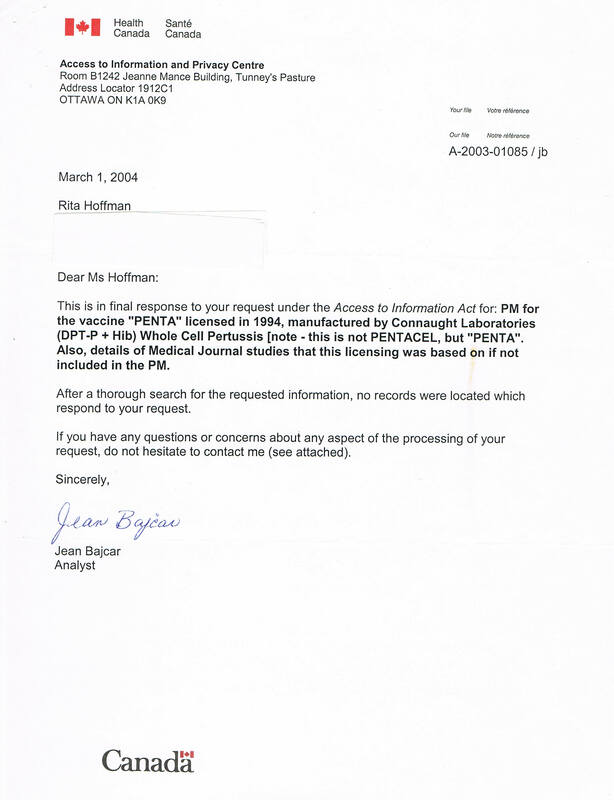 Access to Information requests over many years to all levels of government including requesting PENTA licensing information provided scant information, and Ontario, Canada, and local health unit ATIP responses did not acknowledge that the PENTA combination existed at all! Parents like me have scoured the medical literature to find scientific proof of a vaccine connection to anaphylaxis. The website http://www.deadlyallergy.com resource and science sections outline some of that literature. The book The Peanut Allergy Epidemic, What’s Causing It and How to Stop It by Canadian Historian Heather Fraser MA, BA, B.Ed. details the history of the whole sordid mess. Mrs. Fraser’s book is fully referenced, and should be read by every doctor, nurse, politician, health official and parent. 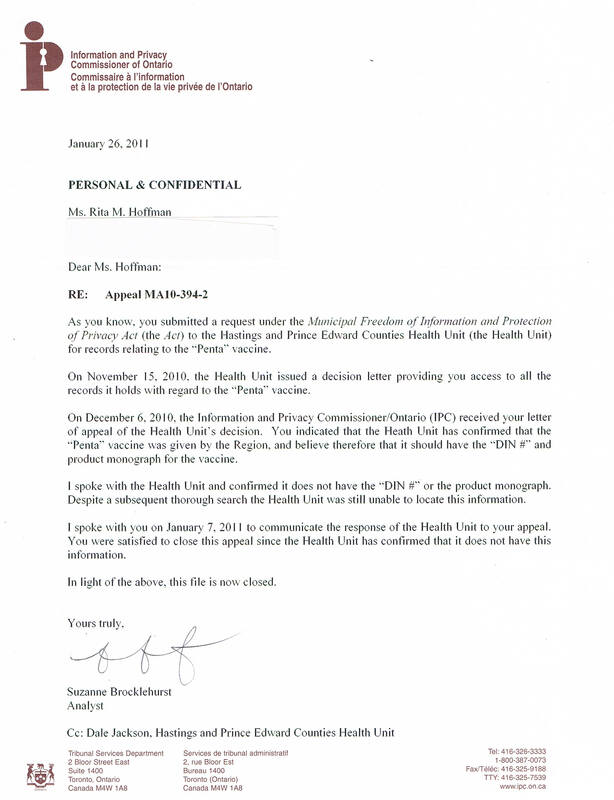 Heather Fraser contacted her Member of Parliament, Nathaniel Erskine-Smith, on June 27, 2016 with a “Request for an investigation into the unlicensed PENTA vaccine & its long term consequences” that was sent to you, Health Minister Philpott, on Heather’s behalf. 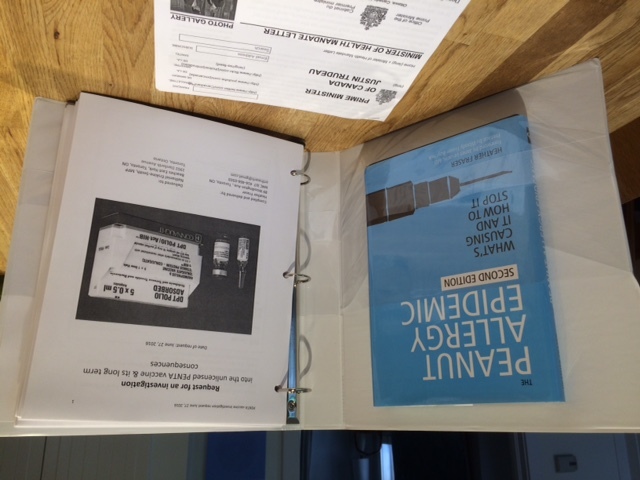 The extensive binder of evidence, memory stick with the full file of PENTA adverse events, along with a copy of the book, The Peanut Allergy Epidemic, never received a response or even the courtesy of an acknowledgement. Minister Philpott, what happened to this material, and when are you going to respond to Heather Fraser? I will send any recipient of this e-mail a copy of Heather Fraser’s book upon request in hopes of SOMEONE finally addressing the long term health effects experienced by the recipients of the PENTA vaccines and children continuing to be affected by the epidemic of anaphylaxis. “After retrieving the lot numbers of the vaccines given to my anaphylactic child I sent in an Access to Information request to Health Canada for 1) the 100% composition of the vaccines my child received and 2) a list of vaccine adverse events reported for the 8 lots he received. Health Canada can’t provide me with a 100% composition because it’s proprietary information. For the adverse event information I was asked to pay $600 down and $1200 in fees. This information, from 1993-95, was not on a computerized database – why wasn’t it? After waiting a year and paying only for photocopying, I received the data from Health Canada. I had to manually count the 975 reactions: death, seizure/convulsion, dysopnoae, speech disorder, allergic reaction, adenopathy, hypotonic-hyporesponsive episode, severe pain and/or swelling, screaming episode, hypokinesia, persistent crying, severe vomiting and/or diarrhea, lethargy, fever, cyanosis, rashes, eczema, pneumonia, lymphocytosis, sterile abcess/nodule/necrosis, infective abscess, tachycardia, gait abnormal, ataxia, bulging fontanelle, sepsis, vaso-vagal reaction, tremor, arthritis, cellulitis, bradyapnoea, delirium, reduced consciousness, shaking, somnolence, anaphylaxis, apnoae, encephalopathy, asthma, injection site reaction, shortness of breath, and confusion. Repeated attempts to get an explanation as to why one particular lot was able to rack up 664 reactions (including 34 seizures/convulsions) without being pulled from the market have gone unanswered by local and Ontario health officials, officials with Health Canada and participants of IMPACT. Also unanswered: The National Report on Immunization, 1996 states: “If the number and type of reports for a particular vaccine lot suggested that it was associated with more serious adverse events or deaths than are expected by chance, the federal government has the responsibility and will, as well as the legal authority, to immediately recall that lot.” The U.S. Centers for Disease Control considers a vaccine “hot lot” one that generates reports of more than two deaths or two convulsions or a total of 10 adverse reports. Health Canada officials reported an investigation should be initiated after a “cluster of reports” and that means “3 or more.” This being the case the majority of vaccines my child received should have been recalled? Why weren’t they? To make matters worse, my recent Access to Information request for a product monograph, including studies that the licensure was based on, for the 5 in 1 “PENTA” (whole cell pertussis, DTPolio combined with Hib) vaccine that Health Canada supposedly licensed in 1994 and my child received in 1995 was answered with “After a thorough search for the requested information, no records were located which respond to your request.” The “PENTA” vaccine is not even listed in the Compendium of Pharmaceutical Specialties for 1993, 1994 or 1995. The United States FDA never approved the 5 in 1 PENTA, and the FDA waited until 2008 to license the acellular pertussis version of PENTA called Pentacel. The FDA approval document for Pentacel lists “several items of concern” … this with a vaccine that had been injected in Canadian children since Pentacel was rushed in to take the place of PENTA on July 1, 1997. As stated above, the Toronto’s SickKids Foundation reports that there are 300,000 children in Canada living with life threatening food anaphylaxis. Are they including the children who received the PENTA vaccine who are now adults? We don’t know. Clearly, anaphylaxis continues to affect children at epidemic proportions in this country. To not mention the vaccine connection to allergy (as shown in the medical literature) prior to vaccination means that parents do not have fully informed consent to vaccination. Now that Ontario is intent on changing the legislation of the Immunization of School Pupils Act to require an “education session” prior to a parent filing an exemption, the province must ensure that fully informed consent is given. I would suggest that until such time that concrete causes of anaphylaxis are found that “vaccines are not tested for their potential to cause allergic disease” must be included in any informed consent discussions with Ontario parents and children prior to vaccination. For that matter, until such time that the cause of cancer is found, a statement such as “vaccines are not tested for their potential to be carcinogenic or mutagenic” (see Section 13) must also be included. Members of the National Advisory Committee on Immunization (NACI) and vaccine decision makers in upper levels of provincial and federal governments should not be allowed to have any Conflict of Interest with any pharmaceutical company. Of the current NACI Chair and Vice Chair (voting) and the 10 voting members 11 out of 12 have indirect or direct conflict of interest. This is unacceptable. According to this Conflict of Interest report the IMPACT network, which is supposed to monitor vaccine injury in this country, is conflicted! (See Wendy Vaudry) ….. “YES …Co Primary Investigator of the IMPACT Network – which is partially supported by grants from Industry (Novartis, GlaxoSmithKline, Sanofi)” This is an outrage! No wonder I never heard from any of the IMPACT participants after pleading for them to look into anaphylaxis in 2002! I request a reply with your suggestions on how to put a halt to this epidemic of anaphylaxis. At the very least, children exhibiting any form of rash or other allergy symptoms should have their vaccinations delayed or offered in individual (one at a time) vaccinations in fractioned doses to prevent the development of severe allergic disease (this was done in the past, see History section of deadlyallergy.com ). Sadly individual doses of infant/toddler vaccine are no longer available. 5 or 6 in 1 and 3 in 1 combination vaccines are the only choices for parents now. Is there any wonder parents are worried when the vaccination schedule begins at 2 months with 7 or 8 different vaccines in 5 or 6 in 1 combinations (depending on the province) at one “well baby visit”? My correspondence may have been confused with Heather Fraser’s package of information sent to Minister Philpott via Heather’s Member of Parliament, Nathaniel Erskine-Smith in the summer of 2016, who is cc’d on my correspondence (attached). Mr. Erskine-Smith is not my Member of Parliament. 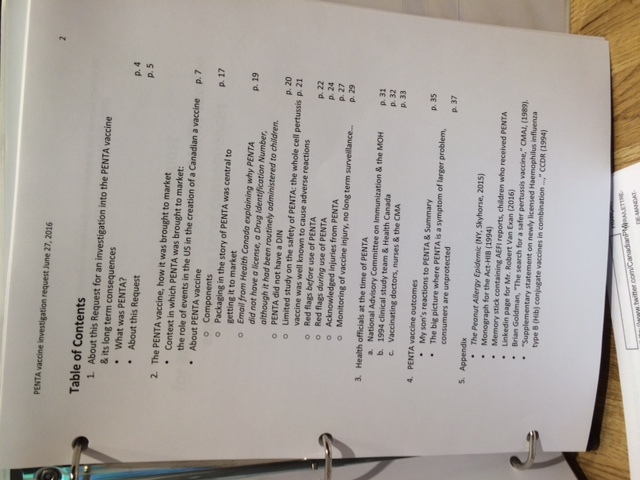 The title of Heather Fraser’s Binder of information was “Request for an investigation into the unlicensed PENTA vaccine & its long term consequences” and she included a copy of her book The Peanut Allergy Epidemic, two CDs with over 25,000 pages of AEFI reports made by doctors documenting adverse reactions and injuries in children who had been vaccinated with the PENTA vaccine. My letter from the Minister states “enclosed copy of The Peanut Allergy Epidemic”. I never sent a copy of The Peanut Allergy Epidemic to Minister Philpott, though I did offer to send her a copy upon request, as stated in my December 12, 2016 letter. Can you please advise if these two different correspondences were confused as I did not send the Minister a book and my MP is not Mr. Erskine-Smith? Also, I am very disappointed to read information in your attached letter that is contradictory to what is known as the law in Canada. The PENTA vaccine 5 in 1 combination did NOT have a DIN #, which is required for licensing of a vaccine product in Canada. You state, “No safety concerns were identified that warranted any action regarding the PENTA Vaccine”. You must not have read my letter or you would have NEVER have said this, as my child’s lot # received hundreds of reported injuries and NOTHING was done. It’s time to acknowledge that Canadian children were, in fact, guinea pigs between 1994 and 1997, and it’s time to launch an investigation as Heather Fraser requested many month ago to ensure that this travesty never happens again in this country. Please find attached a response to your correspondence sent to the Minister of Health. A case of a naturally injected allergen causing the development of allergy. The same team above, now describes their findings regarding food allergy and vaccination. The vaccines caused increases in peanut, almond, milk, egg, soy and wheat IgE. Prevnar 13 contains casamino acids (cow’s milk derived) and soy peptone broth. Polysorbate 80 from EMD Millipore may contain wheat proteins. Polysorbate 80 is present in many vaccines including Prevnar 13. Polysorbate and other excipients derived from vegetable sources are present in many other vaccines and most suppliers do not have allergen information. So polysorbate and other excipients could also be a source of peanut and almond protein contamination of vaccines. MMR contains chick embryo culture proteins and the vaccine package insert4⁠ has a warning for patients with egg allergy. Some egg proteins may be common to or cross react with chick embryo proteins. For case 2, again, MMR could have been the cause of the increase in egg IgE. Clear evidence that food proteins in vaccines turn them into food allergy booster shots that boost the severity of food allergies. Children are taking longer to outgrow allergies.5⁠ How can they outgrow their food allergies, if we insist on giving them food allergy booster shots? This latest evidence adds to the solid body of scientific evidence,2⁠ demonstrating a causal relationship between food protein contaminated vaccines and the development of food allergies. 1. Commins SP, Platts-Mills T a E. Allergenicity of carbohydrates and their role in anaphylactic events. Curr Allergy Asthma Rep. 2010;10(1):29–33. 2. Arumugham V. Evidence that Food Proteins in Vaccines Cause the Development of Food Allergies and Its Implications for Vaccine Policy. J Dev Drugs. 2015;4(137):2. 5. Wang J. Management of the patient with multiple food allergies. Curr Allergy Asthma Rep. 2010;10(4):271–7.